There is something really wonderful about working with a high quality Elm wood easel. The Weber Pompei Studio Easel is really beautiful. It reminds one of the kind of easel similar to one possibly used by DaVinci to paint the Mona Lisa. Crafted from durable Elm wood and finished with Tung oil. Tung oil both protects the wood from water damage and gives it a wonderful golden color with a satin-like finish. Martin Weber began making art supplies in Pennsylvania during 1853. Weber is one of the oldest manufacturers of art supplies in America and because of this the Weber Pompei Studio Easel is superior quality. It is totally adjustable, perfect for both acrylic and oil painting. For watercolors it also adjusts to a horizontal position. The style is professional and at the same time, the easel has a distinct retro feel of the glory of olden times. 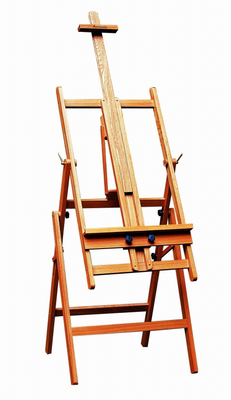 This easel accommodates canvas heights up to 75 inches. The easel dimensions are 59”H x24”W x 29”D. Weber Pompei Studio Easel by Martin Weber. The Pompei Studio Easel is impressive and professional, with a beautiful golden brown color and satin-like finish. A recognizable superior quality. This beautiful easel is fully adjustable and can be used for oil and acrylic painting or, when adjusted horizontally, for watercolor painting. The easel has been constructed in a professional style and is great for anyone looking for a reliable, multi-purpose easel at an amazing price!